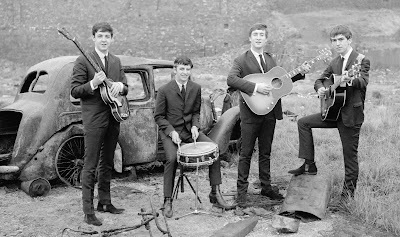 There's a great site, called The Beatles Ultimate Experience, that's been around quite a while, which has collected and pain-stakingly transcribed as many Beatles interviews as humanly possible, from 1962, through to 1984. We're going to start a new 10-part series we're calling The Beatles Interview Series, where we share many of the interviews from that site with our readers here at The Beatles Through The Years. First up is a radio interview with the Beatles from 1962, transcribed by Jay Spangler, and described by Beatles biographer Mark Lewishon, as The Beatles very first radio interview. Per Jay Spangler, "The interview was recorded for Radio Clatterbridge, a closed-circuit radio station serving Cleaver and Clatterbridge Hospitals, on the Wirral." MONTY: It's a very great pleasure for us this evening to say hello to an up-and-coming Merseyside group, The Beatles. I know their names, and I'm going to try and put faces to them. Now, you're John Lennon, aren't you?" MONTY: "What do you do in the group, John?" JOHN: "I play harmonica, rhythm guitar, and vocal. That's what they call it." MONTY: "Then, there's Paul McCartney. That's you?" PAUL: "Yeah, that's me. Yeah." MONTY: "And what do you do?" PAUL: "Play bass guitar and uhh, sing? ...I think! That's what they say." MONTY: "That's quite apart from being vocal?" MONTY: "Then there's George Harrison." MONTY: "How d'you do. What's your job?" GEORGE: "Uhh, lead guitar and sort of singing." MONTY: "By playing lead guitar does that mean that you're sort of leader of the group or are you...?" GEORGE: "No, no. Just... Well you see, the other guitar is the rhythm. Ching, ching, ching, you see." PAUL: "He's solo guitar, you see. John is in fact the leader of the group." MONTY: "And over in the background, here, and also in the background of the group making alot of noise is Ringo Starr." MONTY: "You're new to the group, aren't you Ringo?" RINGO: "Yes, umm, nine weeks now." MONTY: "Were you in on the act when the recording was made of 'Love Me Do'?" RINGO: "Yes, I'm on the record. I'm on the disc." RINGO: (comic voice) "It's down on record, you know?" MONTY: "What's that offensive weapon you've got there? Those are your drumsticks?" RINGO: "Well, it's umm... just a pair of sticks I found. I just bought 'em, you know, 'cuz we're going away." MONTY: "When you say you're going away, that leads us on to another question now. Where are you going?" RINGO: "Germany. Hamburg. For two weeks." MONTY: "You have standing and great engagements over there, haven't you?" RINGO: "Well, the boys have been there quite alot, you know. And I've been there with other groups, but this is the first time I've been there with the Beatles." MONTY: "Paul, tell us. How do you get in on the act in Germany?" PAUL: "Well, it was all through an old agent." PAUL: (chuckles) "We first went there for a fella who used to manage us, and Mr. Allan Williams of the Jacaranda Club in Liverpool. And he found the engagements so we sort of went there, and then went under our own..."
PAUL: "As they say, afterwards, you know. And we've just been going backwards and forwards and backwards and forwards." MONTY: (surprised) "You're not busy at all?" PAUL: (jokingly) "Well yes, actually. Yes. It's me left leg. You know. The war." MONTY: "George, were you brought up in Liverpool?" GEORGE: "Yes. So far, yes." GEORGE: "Well, born in Wavertree, and bred in Wavertree and Speke -- where the airplanes are, you know." MONTY: "Are you all 'Liverpool types,' then?" MONTY: "Now, I'm told that you were actually in the same form as young Ron Wycherley..."
RINGO: "It wasn't Dingle Vale like you said in the Musical Express." PAUL: "No, that was wrong. Saint Sylus school." MONTY: "Now I'd like to introduce a young disc jockey. His name is Malcolm Threadgill, he's 16-years old, and I'm sure he'd like to ask some questions from the teenage point of view." MALCOLM: "I understand you've made other recordings before on a German label." MALCOLM: "What ones were they?" PAUL: "Well, we didn't make... First of all we made a recording with a fella called Tony Sheridan. We were working in a club called 'The Top Ten Club' in Hamburg. And we made a recording with him called, 'My Bonnie,' which got to number five in the German Hit Parade." PAUL: (giggles) "But it didn't do a thing over here, you know. It wasn't a very good record, but the Germans must've liked it a bit. And we did an instrumental which was released in France on an EP of Tony Sheridan's, which George and John wrote themselves. That wasn't released here. It got one copy. That's all, you know. It didn't do anything." MALCOLM: "You composed 'P.S. I Love You' and 'Love Me Do' yourself, didn't you? Who does the composing between you?" PAUL: "Well, it's John and I. We write the songs between us. It's, you know... We've sort of signed contracts and things to say, that now if we..."
PAUL: "Yeah, equal shares and royalties and things, so that really we just both write most of the stuff. George did write this instrumental, as we say. But mainly it's John and I. We've written over about a hundred songs but we don't use half of them, you know. We just happened to sort of rearrange 'Love Me Do' and played it to the recording people, and 'P.S. I Love You,' and uhh, they seemed to quite like it. So that's what we recorded." MALCOLM: "Is there anymore of your own compositions you intend to record?" JOHN: "Well, we did record another song of our own when we were down there, but it wasn't finished enough. So, you know, we'll take it back next time and see how they like it then." JOHN: (jokingly) "Well... that's all from MY end!" MONTY: "I would like to just ask you-- and we're recording this at Hume Hall, Port Sunlight-- Did any of you come over to this side before you became famous, as it were? Do you know this district?" PAUL: "Well, we played here, uhh... I don't know what you mean by famous, you know. PAUL: "If being famous is being in the Hit Parade, we've been over here-- we were here about two months ago. Been here twice, haven't we?" JOHN: "I've got relations here. Rock Ferry." JOHN: "Yes. Oh, all sides of the water, you know." PAUL: "Yeah, I've got a relation in Claughton Village-- Upton Road." RINGO: (jokingly) "I've got a friend in Birkenhead!" MONTY: "I wish I had." GEORGE: (jokingly) "I know a man in Chester!" MONTY: "Now, that's a very dangerous thing to say. There's a mental home there, mate. Peter Smethurst is here as well, and he looks like he is bursting with a question." PETER: "There is just one question I'd like to ask. I'm sure it's the question everyone's asking. I'd like your impressions on your first appearance on television." PAUL: "Well, strangely enough, we thought we were gonna be dead nervous. And everyone said, 'You suddenly, when you see the cameras, you realize that there are two million people watching,' because there were two million watching that 'People And Places' that we did... we heard afterwards. But, strangely enough, it didn't come to us. We didn't think at all about that. And it was much easier doing the television than it was doing the (live musical performance) radio. It's still nerve-wracking, but it was a bit easier than doing radio because there was a full audience for the radio broadcast." MONTY: "Do you find it nerve-wracking doing this now?" MONTY: "Over at Cleaver Hospital, a certain record on Parlophone-- the top side has been requested. So perhaps the Beatles themselves would like to tell them what it's going to be." PAUL: "Yeah. Well, I think it's gonna be 'Love Me Do.'" MONTY: "And I'm sure, for them, the answer is P.S. I love you!"